Hello Dealsnloot readers,You will get Rs 50 paytm cash for signup at tallentbox and Rs 10 paytm cash for referring each friend. 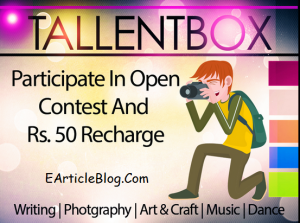 This is an amazing offer from tallentbox. So Guys Add More Rs 10 Paytm to Your Main Balance For Taking Part In Simple Contest.Grab This loot Offer and Get Earn Unlimited Paytm Cash Loot. Firstly signup on tallent box web from here. Now fill all the necessary details and click on register. Now verify your email I’d. Now you can see 50 points in your wallet. You will get your own refer link you will get 10 paytm cash for every successful refer. Payout will be done on weekly basis minimum 500 Rs bedded for paytm redeem and 1000 for bank transfer. How to Get TallentBox Entry Or Refer Link ? => Payout will be done on 15th and 30th of every month. => Minimum payout amount for bank transfer is Rs 1000.